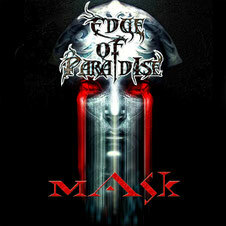 Edge Of Paradise is the Los Angeles based female-fronted metal band. Dave Bates and Margarita Monet formed Edge Of Paradise in 2011, while working on another musical collaboration "for hire" with a producer in Los Angeles. The addition of Kevin Katich on drums and Steven Cook on bass in the later half of 2011 solidified Edge of Paradise's line up. And they have released the debut album MASK by digital sales worldwide in September, 2011. MASK also features guest appearances by renowned session drummer Gregg Bissonette (David Lee Roth, Don Henley and major session drummer for hit-TV and movie soundtracks) and bassist extraordinaire Tony Franklin (The Firm, Glenn Hughes, Blue Murder, Roy Harper) who prove to be the ultimate rhythm section when it comes to the hard-edged rock sounds contained on the debut recordings. Other guests on the CD include bassist Bjorn Englen (Yngwie Malmsteen), drummer Craig Anderson and backing vocals from Robin McCauley (MSG) who also co-wrote most the songs along with Dave and Margarita, and cutting-edge songwriter Ryan Jones. This album is now available at thier website and amazon.com. You can download the song Shredenstein from this album for FREE at SOUNDCLOUD. See the DOWNLOAD section.